As our pets get older and walk slower they will need extra TLC. 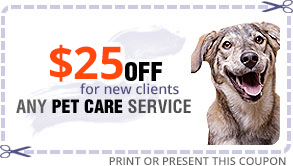 We specialize in caring for older pets. Here is a picture of Thunder a husky-malamute dog who had both of his eyes removed within a year of each other. When he came over for doggy day care we simply added bells to all the dogs’ collars so Thunder could hear everyone’s whereabouts. It was amazing to watch as he adjusted to his surroundings after becoming blind.